Created using three metric tons of steel, the megaphone stands as a call to celebrate and remember Mr. Deva’s achievements and advocacy regarding freedom of speech. The installation is intended as a commemorative, yet playful “Speaker’s Corner” feature for the plaza. Accessible to all, everyone is welcome to use it. Using the eight stripe pride flag for inspiration, the pink colour of the megaphone represents sexuality while the turquoise symbolizes art. The Jim Deva Plaza Living Legacy statement can be found on the inside of one of the megaphone panels, encouraging us to remember the values that Mr. Deva stood for. 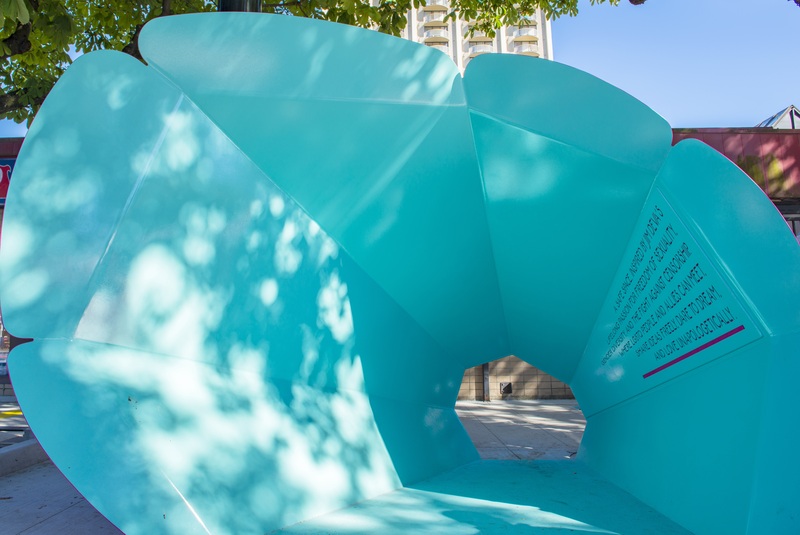 The megaphone was designed by Hapa Collaborative, with guidance from the City of Vancouver’s LGTBQ2+ Advisory Committee and the Persons with Disabilities Advisory Committee. On April 15, 1983, Jim Deva, along with his partner Bruce Smyth and friend Barb Thomas, opened the doors of the Little Sister’s Book and Art Emporium. From these humble beginnings, Jim built a profound and enduring legacy that would shape Vancouver’s LGBTQ2+ community and challenge the censorship laws at the highest court in Canada. Two years later on May 29, 1985, Canada Customs officials deemed material destined for the shelves of Little Sister’s as obscene, and seized the first of many literary titles. Little Sister’s appealed the seizures and, with the support of store manager Janine Fuller, the BC Civil Liberties Association, and the larger community, began a court battle that lasted over two decades. The case became known as “Little Sister’s vs. Big Brother”. Despite mounting court costs and three bombings of the Little Sister’s store, Jim and his team brought their case before the Supreme Court of Canada. In 2000, the Supreme Court ruled that Canada Customs had unfairly targeted the store. However, Canada Customs’ seizure of materials began again within a year. Jim and Little Sister’s challenged these actions again. In 2007 the Supreme Court upheld a ruling denying Little Sister’s funding for their case. Unable to sustain further legal action, Jim and his team were forced to abandon the case. To this day Canada Customs still has the authority to deem literature obscene without oversight or review. Jim Deva was also dedicated to improving the livability of the West End. His leadership and advocacy focused on ensuring that parks and public spaces were enjoyable, safe and inclusive spaces. 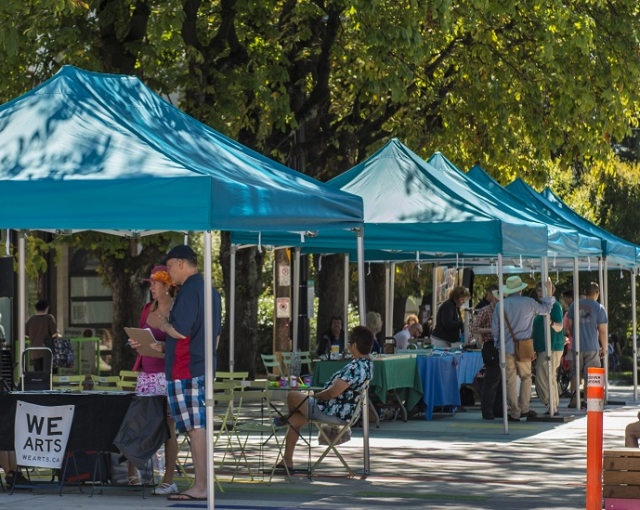 From 2004 to 2005, Jim participated extensively in the redesign process of Nelson Park, with the goal of making it a more inclusive space for all residents. From 2004 to 2006, he was a member of the West End Integrated Neighbourhood Network, whose mandate was to advise City Council on strategies to improve the safety and quality of parks and public spaces. Jim also served on the West End Mayor’s Advisory Committee (2010 to 2011), and recommended strategies to protect and improve parks and green space. Jim Deva died tragically in 2014. He is fondly remembered as a cornerstone of his community who was committed to inclusive public space and a leader who rallied against anti-gay violence in Vancouver. Through Little Sister’s lengthy court battle, he became an ambassador for the LGBTQ2+ community and a champion for free speech in Canada.